While hits rule the hobby, the bulk of many collections are the common insert and base cards. This is where Ultra Pro card pages come into play. Storage boxes may make better use of limited space, but card pages offer a much better enjoyability for collectors, in terms of storage and display. Like the Ultra Pro card sleeves, the pages are made of polypropylene. 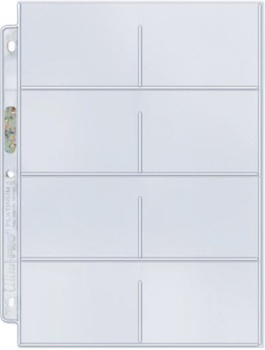 The pages feature both the common three-hole variety for most US binders, and 11-hole options, which are geared toward international binders. There is also an extensive inventory of individual card pages that will cover most trading and sports cards in existence. While many of the pages each cater to a particular type of card, several elements are present among the group. Super Strong Welds - The welds are what allows the pages to hold more than one card. Different welding results in the variety of cards that can be held, in both quantity and size. While it seems like a very simple element, weak welds would defeat the whole purpose of storing cards in pages. No PVC, Acid Free - Similar to the Ultra Pro Card Sleeves, there is no PVC used in the card pages. The archival quality pages are also acid-free. UV Protection - Given the fact that these pages reside in a binder, UV protection may not seem as necessary for card pages. However, the binder does not seal the card pages in and they are still exposed to light. And there are always instances where you have run out of binder space and the card-filled pages sit in stacks, waiting for a home. Since it comes standard, UV protection is a nice added benefit. Plus, collectors can feel a little better about accidentally leaving a binder open for an extended period while searching for a particular card. Lays Flat - As any collector of chromium or Refractor cards can confirm, warping causes problems in collecting. Ultra Pro pages are designed to lay flat which prevents direct damage to the cards and allows them to be better contained in binders. Solid Seals - Solid seals are another overlooked, but important aspect of card pages. As the name implies, the seal is solid, as opposed to intermittent, which resembles a perforated edge. This assures complete overall protection and prevents the possibility that vulnerable portions of the page could breach and result in a useless page. 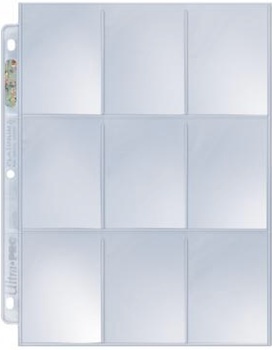 Multiple Sizes - Most collectors are familiar with the common 9-pocket pages, but Ultra Pro offers many card page options. 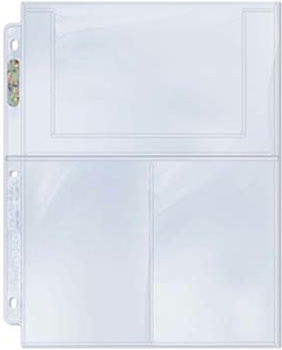 While all the pages are essentially the exact same overall size, the variety comes in the number of pockets, the pocket size and the pocket orientation. It is important to know the exact size of the cards in question, to better expedite the process of purchasing your card pages. Also, for the traditional 9-pocket pages, the maximum recommended card thickness is 35 pt. 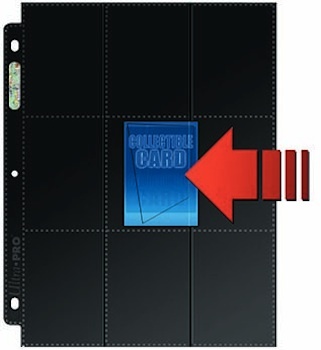 Anything larger and you are risking damage to the card and stretching out the pockets of the page. 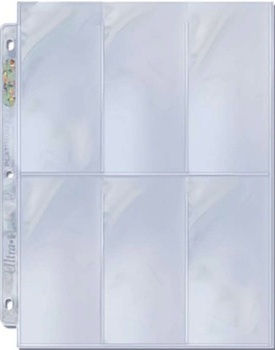 Side-Load Pages - Although they are not found as commonly as the top load pages, side-load pages from Ultra Pro are a great option for collectors who prefer to carry their binders around under their arm and still want to easily access individual cards. Also, collectors may find that constantly inserting and removing cards may stretch out the pockets and this makes the cards more susceptible to falling out. 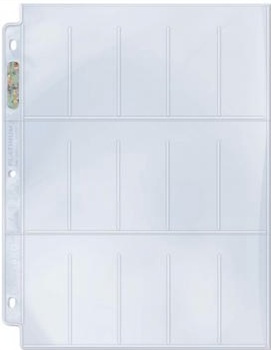 Side-load pages help cards to better stay in the binder. The Ultra Pro card page lineup is listed below with any relevant information. Most of the pages come 100 per box, but can be found in smaller amounts, as well. The most popular versions are the 9-pocket pages, and those are listed first. From there, pages are listed by total cards held, from highest number of cards to lowest. The list also features a helpful shopping guide for each product. Follow the links below to check current prices and purchase the various pages on Amazon or eBay. Fits up to 2-1/2" X 3-1/2" cards. Heaviest gauge - 115 microns on each side of the material. Can be distinguished from the Silver Series by the markings on the spine of the page. Medium gauge - 90 microns on each side of the material. Can be distinguished from the Premium Series by the markings on the spine of the page. While they still display the same way, cards are loaded from the side, as opposed to the normal top-load versions. 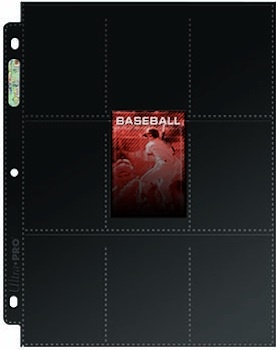 Ideal for coins, but can be used for small cards or 2013 Topps MLB Chipz. Holds 20 cards or coins. Fits up to 2-1/8" X 2-1/8" cards (approx). Holds 18 standard cards, with 9 pockets on each side. Ideal for cards with blank backs. Uses a black inner material with clear layers on both sides. This necessitates an intermittent seal and weld. The black inner web helps frame the cards. Uses a black material with clear layers on both sides. This necessitates an intermittent seal and weld. Fits up to 1-1/2" X 2-1/2" cards. Fits up to 2-1/2" X 2-1/4" cards. Fits up to 2-3/4" X 3-1/2" cards. Ideal for slightly larger cards, such as 1952 Bowman Large Football. Cards display horizontally, as opposed to the normal vertical orientation. Fits up to 2-1/2" X 5-1/4" cards. Ideal for tall boy cards. Fits up to 3-1/2" X 5-1/4" cards. Holds 3 cards or photos. Fits up to 4" X 6" cards. 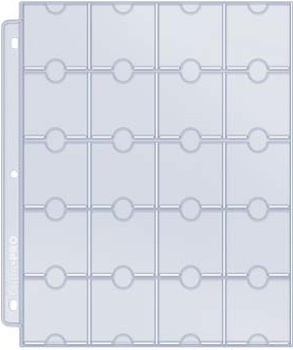 Displays 2 cards vertically, and 1 card horizontally. 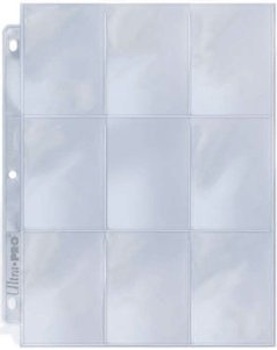 9 Pocket Pages Sheets Case of 1,000 Ultra Pro Platinum 1000 New! Given the large amount of base and inserts cards that I have, the majority of my cards are stored in standard 9-pocket pages. The overall protection, affordability and convenience of a book-style format that can be easily viewed make it a useful choice for me and many other collectors. However, one thing I have experienced with the pages over time is that the open slots are vulnerable to dust and debris and even the possibility that the cards can fall out of the pages. This has even happened to me in the past. Although this is not the norm, the threat of damage can make me a bit uneasy, especially when taking cards on a road trip or moving. In addition to the more standard page choices documented on the tabs above, Ultra Pro has also developed a new line of pages with added security and protection in mind. 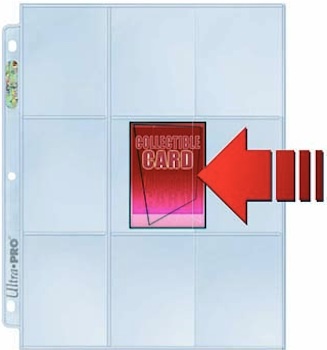 The Secure Platinum Page maintains the same level of quality that collectors have come to expect, but adds a protective flap to better hold cards in place and greatly cut down the threat of foreign objects making their way into the individual sleeves or the cards falling out. Sized for traditional cards, the difference is quite small but can have a huge effect. One thing I noticed when adding my cards to the pages is that the flap can slow the process if you try to slide them in with the page on a level surface. Things went much more smoothly when I let the pages naturally bend at their seams for each level, forcing the new flap up and making it easier to add the cards into each pocket. The overall addition may not seem like much, but it certainly locks them in place much more securely. 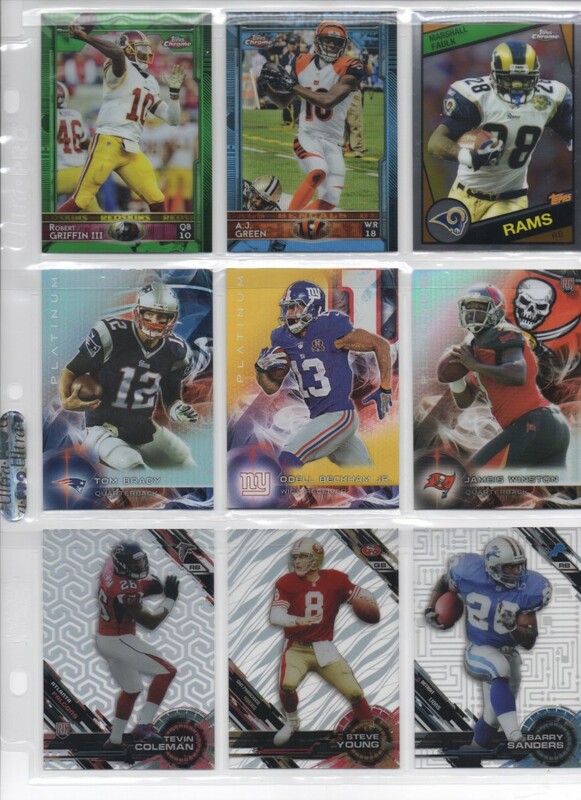 If you check out the scan below you should be able to see the thin strip that runs along the top of the pockets and essentially closes off the cards in each section. The plastic strip features the same composition as the pages themselves. 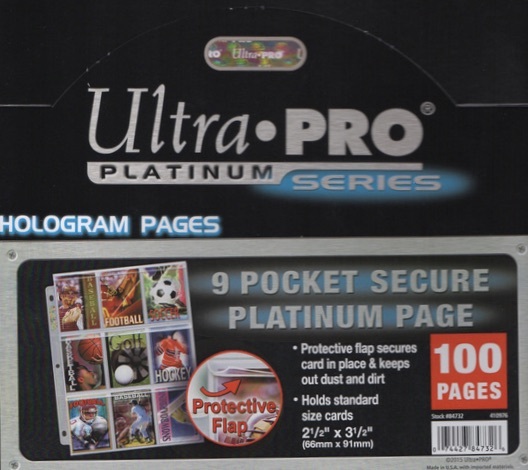 The new Ultra Pro 9 Pocket Secure Platinum pages are available worldwide and the retail pricing is a few dollars more than the regular pages. Boxes come with 100 pages. Buy Ultra Pro Secure pages on Amazon. What do you think about this new option for storing and protecting your cards? Is this something you would be interested in purchasing? Is there another element of card protection that you would like Ultra Pro to address? Could you please recommend me which one to buy? I want to ensure the card inside will never get scratched and is forever protected. Serena � Looks like just a Card Saver. This is a very simple case mainly used for submitting cards for grading. 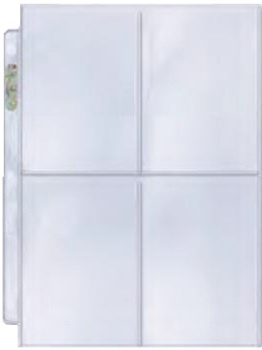 If you are looking to protect your cards longterm, you can try top loaders (https://www.cardboardconnection.com/ultra-pro-toploaders) or magnetic cases (https://www.cardboardconnection.com/ultra-pro-magnetic-cases). 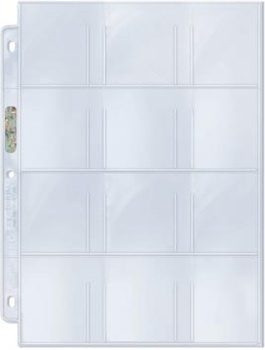 Do you sell 4 pocket sheets for 3 1/2 x 5 1/2 football cards? I have a set of 1970 Topps Super cards that are 3 1/8 x 5 1/4 size. I would need nine of those sheets. Thanks. I click on the link for 15-Pocket Platinum Series Tobacco and get directed to an Amazon search page with listings for five other items w “15” in the title. Nothing about Ultra pro card collector pages.